Sprague Lake is the largest lake in Adams county at 1,841 acres. This lake is in Adams & Lincoln Counties with 2 access points in Adams county and 2 in Lincoln County. Some people think this lake is in Spokane County, which it is not. This large lake is two miles west of the town of Sprague, along the south side of I-90. It was called Big Lake in some old surveys and until 1950 was known as Colville Lake. This is a windy lake with winds typically coming from the west and at times can exceed 20 knots. This is a fantastic sailing lake due to the consistent winds and open water, and great for Ice sailing as well. Due to the consistent winds on this lake its not so good of course for water skiing. Harper Island which is a bird sanctuary is on the S.W. end of the lake. 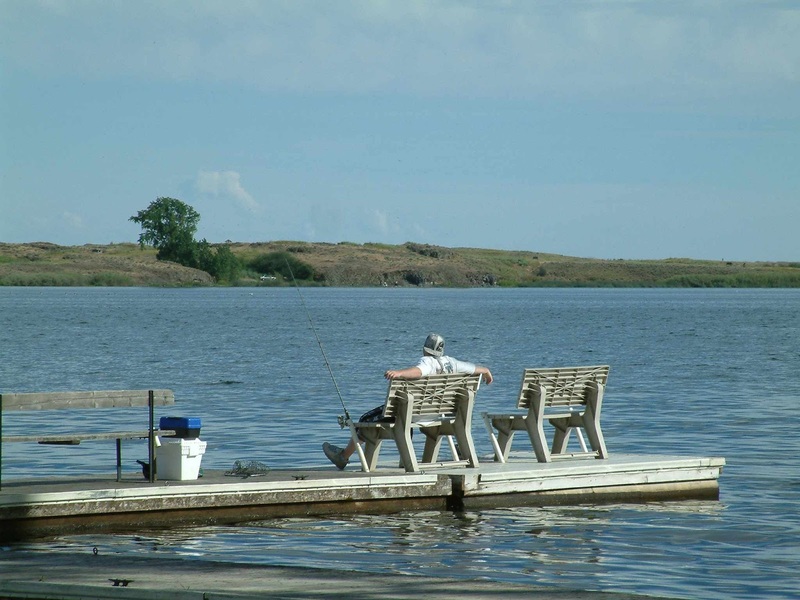 This is a very popular fishing lake for walleye, largemouth and smallmouth bass, crappie, channel catfish, perch, bluegill, and rainbow trout. Access is southwest through the town of Sprague. 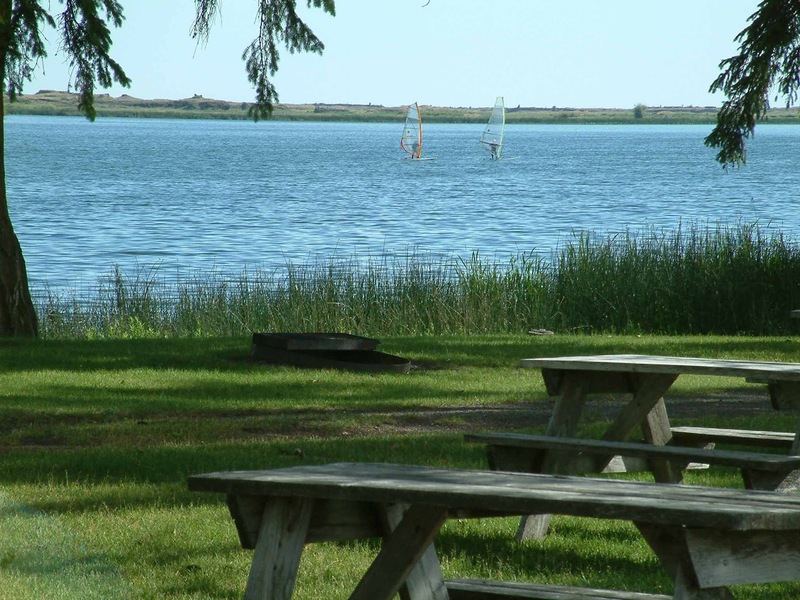 WDFW has two public boat launches, one with a toilet on the southwest end of the lake and the other on the east end of the lake, and there are two a private boat launches in association with two resorts with day use fees on the southeast side and north east end of the lake. Fishing: Black Crappie, Bluegill, Catfish, Largemouth Bass, Rainbow Trout, Spiny Ray, Walleye, Yellow Perch. Lake Dimensions & Coordinates: 1,841 acres; Maximum depth estimated at 65 ft; elevation 1878 ft; Coordinates T20/21N R37/38E. Longitude 118d 1m 4s -to- 118d .6m 10s west. Latitude 47d 14m 15s -to- 47d 17m 28s N. Info: City of Sprague info at this link http://www.sprague-wa.us . This launch site has a rugged rocky primitive boat launch. The water depth at this site is shallow of only 2-3 ft. With large gravel parking lot and public restroom. There is a tree that overhangs the launch site so those launching sailboats will need to step mast in the water if the mast is to tall. ACCESSIBILITY: PARKING... Gravel parking; PATHS/TRAILS... None; RESTROOMS/FACILITIES… One accessible restroom; SENSORY... No sensory tactile markers for those with visual and other impairments. DOCKS/LAUNCHES/PLATFORMS… No dock. One wide gravel rock launch of about 3% grade into shallow water; DIRECT WATER ACCESS… No access for wheeled mobility devices. Launch is wide so one utilizing a wheelchair could potentially access the water when no powerboats are present; TRANSFER SYSTEMS... None; CAMPING... None. There are two camping resorts on this lake; O.T.H.E.R… Oddities/Barriers: Nothing unusual; Terrain: Level to 3% grage. Very rocky and sandy; H2O/Water: Water on this lake is never really clear and in late summer is murky with algae. Water temperature in the summer can be around 70 degrees; Environmental Conditions: Little to no currents. Water can become stagnant. High wind and hit are common in this area; Resources: Food, drinks, and gas within town of Sprague. This launch site has a muddy rocky combo launch suitable for lightweight watercrafts. Site includes a large rocky parking area, with no restroom or other facilities. 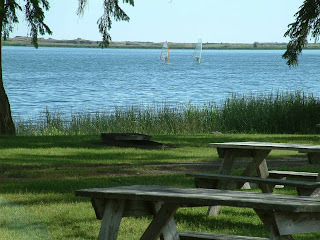 This resort with launch is located on the northeast end of the lake http://www.spraguelakeresort.com / 509-257-2864). Has cabins, tent, and RV sites, restrooms, and docks. Has very primitive with mud/dirt/gravel launch. Directions: From Spokane on I-90 W. take 245 and from there you follow the signs to the resorts, etc. The town of Sprague is really run down for example you will turn on B street to get to 1st. street yet 1st street is marked incorrectly as B Street. So going to the resorts and landings you follow B street to B Street. ACCESSIBILITY: PARKING... Gravel parking; PATHS/TRAILS... None; RESTROOMS/FACILITIES… One well maintained restroom but not accessible to wheelchairs; SENSORY... No sensory tactile markers for those with visual and other impairments. DOCKS/LAUNCHES/PLATFORMS… Two docks, not wheelchair accessible. One gravel rock launch of about 3% grade into shallow water; DIRECT WATER ACCESS… No access for wheeled mobility devices; TRANSFER SYSTEMS... None; CAMPING... Tent and full hookup RV campsites; O.T.H.E.R… Oddities/Barriers: Nothing unusual; Terrain: Level to 3% grade. Very rocky and sandy; H2O/Water: Water on this lake is never really clear and in late summer is murky with algae. Water temperature in the summer can be around 70 degrees; Environmental Conditions: Little to no currents. Water can become stagnant. High wind and hit are common in this area; Resources: Food, drinks, and gas within town of Sprague. Four Seasons Resort is located on the west end of the lake on the north shore. 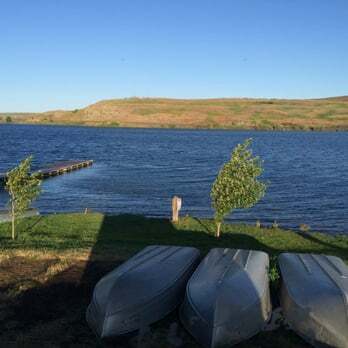 This is a well developed resort with tent and RV campsites, nice restroom, store, several docks, and a single gravel/muddy boat launch suited for light weight boats. The resort also rents fishing boats. http://www.fourseasonscampground.com/guidelines.asp 509-257-2332. I feel 4 Seasons is best used for sailing due to the depth you can launch into and quick access to the more windy part of the lake. Directions: From Spokane on I-90 W. take 245 and from there you follow the signs to the resorts, etc. 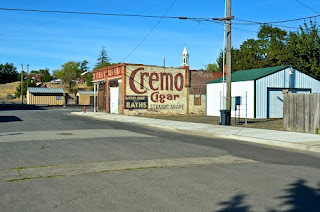 The town of Sprague is really run down for example you will turn on B street to get to 1st. street yet 1st street is marked incorrectly as B Street. So going to the resorts and landings you follow B street to B Street. ACCESSIBILITY: PARKING... Gravel parking; PATHS/TRAILS... None; RESTROOMS… Well maintained and fully accessible to wheelchairs; SENSORY... No sensory tactile markers for those with visual and other impairments. DOCKS/LAUNCHES/PLATFORMS… Two docks, one of which one could access with a wheelchair (not ADA compliant); DIRECT WATER ACCESS… No access for wheeled mobility devices; TRANSFER SYSTEMS... None; CAMPING... Tent and RV camping with full hookups; O.T.H.E.R… Oddities/Barriers: Nothing unusual; Terrain: Level to 3% grade. 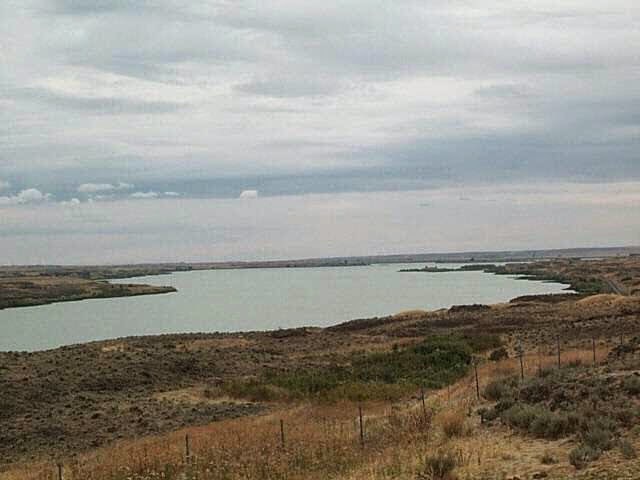 Large grassy areas and gravel roads and walkways; H2O/Water: Water on this lake is never really clear and in late summer is murky with algae. Water temperature in the summer can be around 70 degrees; Environmental Conditions: Little to no currents. Water can become stagnant. High wind and hit are common in this area; Resources: Food, drinks, and gas within town of Sprague.